Those of you who have the insufferable task of sleeping next to a snoring partner might want to take a trip to Aldi. Why? 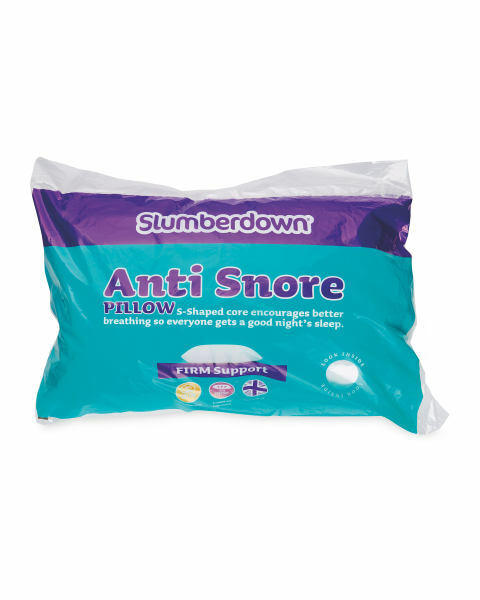 Because the supermarket is stocking an ‘anti-snore’ pillow costing just £4.99 as part of its weekly ‘Specialbuys’ range. Whether it’s you or another family member, this specially designed pillow raises the head during sleep to keep the airways open, ensuring the night can go by without too much noise. The pillow is available online to pre-order now. Aldi’s Specialbuys range also includes an Orthopaedic Support Pillow for £4,99 and a Kirkton House Relaxation Pillow, for £5.99. Snoring is generally viewed as something just incredibly annoying rather than a problem, but research found those who do it could be at risk of serious health issues. Researchers found people who snore regularly have ‘much higher risk’ of having thicker or abnormal carotid arteries, adding the risk is ‘greater for snorers than overweight people and smokers’. Researchers at Detroit’s Henry Ford Hospital investigated the possible effects of snoring on the cardiovascular system and found snoring is ‘associated with a thickening of the inner walls of the carotid arteries’, writes Medical News Today. This thickening could be an early sign of ‘carotid artery disease’, which is a narrowing or blocking of the arteries and it increases the risk of having a stroke. Researchers also found people who snore were more likely to suffer from this thickening than others with more widely known risk factors for cardiovascular disease, including smokers, people who are overweight and those with high blood pressure and high cholesterol. Snoring is more than a bedtime annoyance and it shouldn’t be ignored. Patients need to seek treatment in the same way they would if they had sleep apnea, high blood pressure or other risk factors for cardiovascular disease. Our study adds to the growing body of evidence suggesting that isolated snoring may not be as benign as first suspected. So instead of kicking your snoring bed partner out of the room or spending sleepless nights elbowing him or her, seek out medical treatment for the snorer. Scientists at Harvard University found sleep disorders, like OSA, are linked to ‘greater cognitive decline’, especially among those with a gene which predisposes them to Alzheimer’s, reports Evening Standard. People who suffer a sleep disorder and carry the apolipoprotein gene were found to have memory loss and their ‘thinking function’ was said to be particularly poor. ← What Hair Colour And Length Is The Most Attractive?